The Zumin square 24cm pure silk lamp shade in peppercorn, lined in bronze laminate is hand made in Britain to order. A 10″ square table lamp shade with rounded corners in peppercorn silk fabric lined in bronze laminate. Suitable for an E27 lampholder and supplied with a reducer ring to fit B22 lamp holders. Suitable for the Author table lamp. 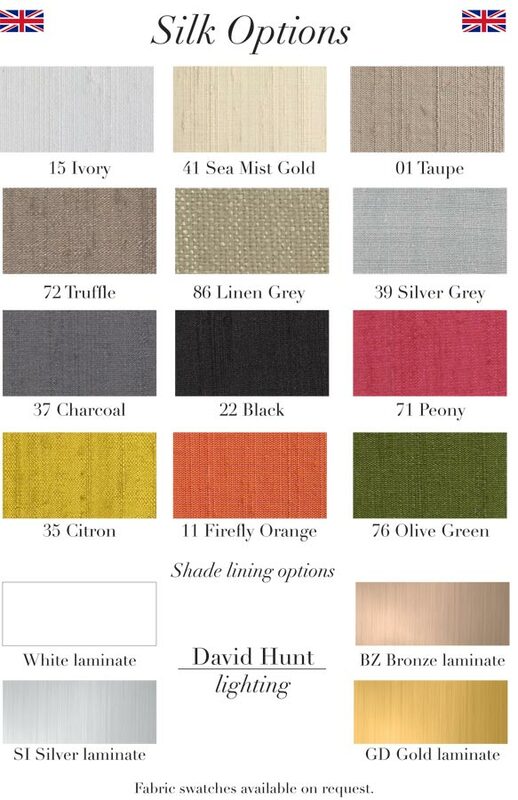 Also available in twelve sumptuous colours either lined or unlined. Please see the secondary image and contact us with your requirements. Hand made to order, please allow 2 – 4 weeks for your delivery.